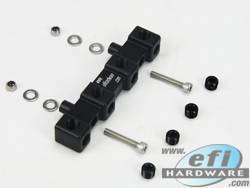 2 circuit 1/8 NPT Threaded External Pressure Sensor Mounting Block. 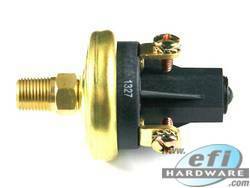 4 circuit 1/8 NPT Threaded External Pressure Sensor Mounting Block. 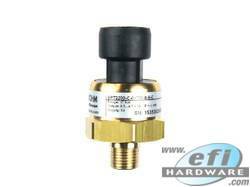 Pressure sensor to suit fluid or gas pressures, up to 15PSI Gauge Pressure (above atmospheric pressure). NOTE: For use with Coolant, Air and Oil. - Do not use with Fuel. MAP Sensor to suit intake charge pressures, up to 6 Bar (75PSI Boost Pressure (above atmospheric pressure). 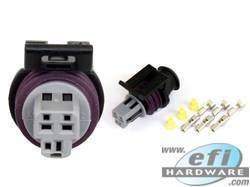 Use with H-SEN-MSC plug. Pressure sensor to suit fluid or gas pressures, up to 100PSI Gauge Pressure (above atmospheric pressure). NOTE: For use with Coolant, Air and Oil - Do not use with Fuel. Pressure sensor to suit fluid or gas pressures, up to 100PSI Gauge Pressure (above atmospheric pressure). Use with H-SEN-MSC plug. TI Pressure sensor 100 PSI Absolute. 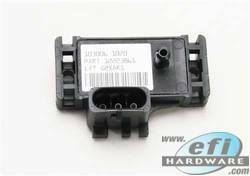 6.5 Bar Map Sensor. All Bosch High Pressure Sensors provide very reliable and accurate measurements and have extremely fast response times. M10x1.0 Metric Female to 1/8 NPT Male. Compact Genuine Bosch 145 PSI / 10 Bar Pressure sensor and combination Temperature sensor. This as an economical option to many of the common 150 PSI Sensors in the Honeywell, Ti and Variohm brands. 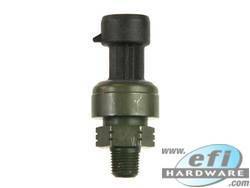 Although it has to M10 x 1.0 Thread a Stainless Steel 1/8 NPT Adapter also available Part Number H-PS150-ADPT. This will allow fitment into a 1/8NPT threaded hole used by other sensor brands. Combination 145PSI Pressure Sensor and Temperature Sensor. Pressure sensor to suit fluid or gas pressures, up to 150PSI Gauge Pressure (above atmospheric pressure). Use with H-SEN-MSC plug. TI pressure Sensor 150 PSI. Pressure sensor to suit fluid or gas pressures, up to 150PSI Gauge Pressure (above atmospheric pressure). Compact Genuine Bosch 2000 PSI Pressure sensor. 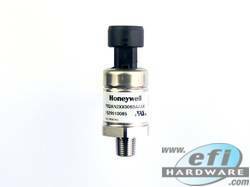 This pressure sensor is actually 140 BAR or 2030 PSI, but is listed as an economical option to many of the common 2000 PSI Sensors in the Honeywell, Ti and Variohm brands. Although it has to M10 x 1.0 Thread a Stainless Steel 1/8 NPT Adapter also available Part Number H-PS150-ADPT. This will allow fitment into a 1/8NPT threaded hole used by other sensor brands. This is a Premium Quality Motorsport Series Connector For TI and Honeywell Pressure Sensors. Also Fits GM TPS. Pressure sensor to suit fluid or gas pressures, up to 250PSI Gauge Pressure (above atmospheric pressure).